ITAHARI, Oct 5: For Bikash Nagarkoti of Itahari Sub-metropolitan City - 3, Dashain has always been his best festival since childhood. No matter what he would always enjoy the festive season to its fullest. This year, however, he was helpless. “Dashain is the greatest festival of Hindus and we value it no less. However, this time we could not manage to celebrate it,” he lamented. Nagarkoti’s family is one among the many who did not celebrate this year’s Dashain. These were families whose normal life was derailed by the floods of August 13. Some of theirs’ houses were washed away while some others’ were damaged. Most of them lost their cattle and some even lost their lands to the flood. “That night we lost everything. The flood wreaked havoc in our life,” said Nagarkoti, who has been living life of a displaced since then. Several parts of Sunsari were affected by flood on that day. Budhi River had entered human settlements and had seriously damaged western parts of the district where Nagarkoti’s house was situated. “Neither red tika, nor jamara. We had dry Dashain or say, no Dashain at all. We had no space to grow jamara and no atmosphere to prepare for Dashain. So, this time we just let it go,” he explained. 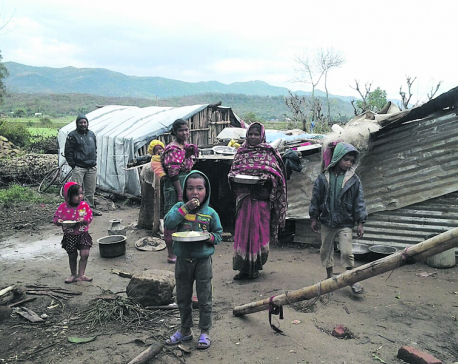 Along with dozens of others, Nagarkoti’s family is living in a tent. And that leaks whenever it rains. There are no windows in the tent and has a small passage to enter. His family, which consists of his wife and a toddler, has been living under that tent. Nagarkoti said that the Itahari Sub-metropolitan City had provided Rs 2100 to each of the flood victim families as allowance to celebrate Dashain. However, he said without home to celebrate the festival, the fund was seriously insufficient. “The ward office gave the money to us. But what could we do with a meager amount of Rs 2100. If we had celebrated Dashain, the fund would not have even sufficient to give Dakshina to the relatives visiting us,” he stated. “And we could not go out to our relatives for Dashain tika because we feared that even the few utensils we have could be stolen from the tent. So, there was no way for us to celebrate Dashain,” he added. Dashain is now over. Flood victims like Nagarkoti are now worried more of the winter. Presently also they are feeling cold at night and they fear for their families if they have to spend winter too in the tent. According to Nagarkoti, they are sure to fall sick if they are not resettled within a month. “For the past few weeks, the cold has been steadily increasing during night. 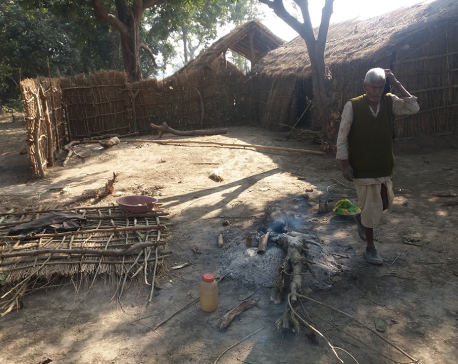 Without proper shelter, we are certainly going to face a brutal winter,” he said while expressing concerns for his family. Nagarkoti is a mason. In peak season, his earning is pretty good. However, that is not enough to make some savings. “Whatever I earn is spent. We can hardly save for future. So, when there is no work, we don’t have money for even daily expenses,” he said. “And I am getting no work these days,” Nagarkoti added. Nagarkoti’s wife sells chatpate and makes little money out of it. Or else, they would have starved to death, he says. “She sells chatpate. Otherwise, we would not have anything to eat,” Nagarkoti said. Over the time several organizations have distributed food to these flood victims but according to Nagarkoti, it is not sufficient. “They come and give food sometimes. But, we can’t depend on them. Moreover, some people have big family and the food donated is not sufficient,” he said. Nagarkoti’s house has been fully damaged by the flood. Until and unless the government extends substantial support, he cannot rebuild it, he says. Next to his tent was quietly sitting a youngster Jiwan Khati, whose mother died recently. And he puts the blame of her death on the ‘lack of care’ post flood. The 70-year-old had died due to cold, informed his neighbors. “We could not afford proper bed or blanket for her even when she was sick,” said Khati. “She would not have died if we were not living in a cold tent,” he added. The flood took everything he possessed, said Khati. “We never thought that we would see such a miserable life someday,” he lamented. Makarbahadur Limbu, another flood victim stated that Dashain has not touched the lives of the people like him. Even the government did not arrange anything for them for the festival, he complained. “The government has nothing to do with the poor and helpless people. Or else, they would have arranged something for us,” he added. He urged the government to discriminate between flood victims that are severely hit and slightly hit. For those in acute need, there must be greater support while those whose houses were slightly damaged and are already back to normal life, should be provided with minimal support, he said. “But, you see, many of those who are not even affected are getting relief from several organizations. On the other hand, hard-hit victims are living a very pathetic life. The government must investigate and make plans accordingly,” he said. 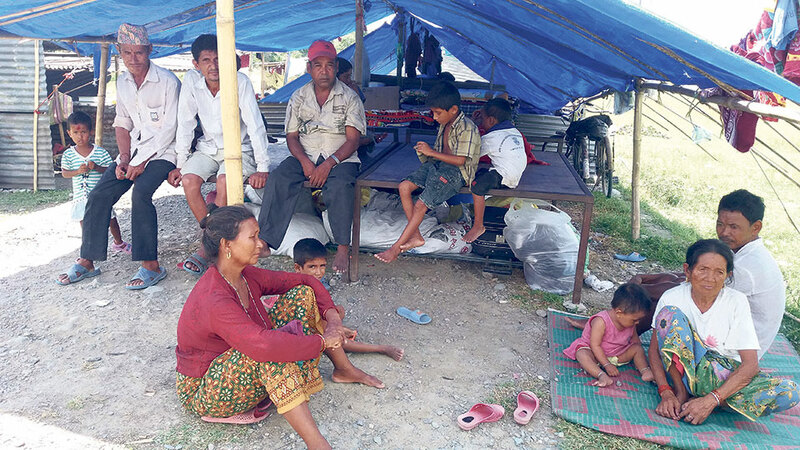 Around 30 flood victim families that are living in tents in Sunaulo Tole of Itahari Sub-metropolitan City- 3 did not celebrate Dashain of this year.